Wednesday, October 12th marked the end of Buddhist lent and what better way to celebrate than with boats, booze, burning, and bottle rockets. 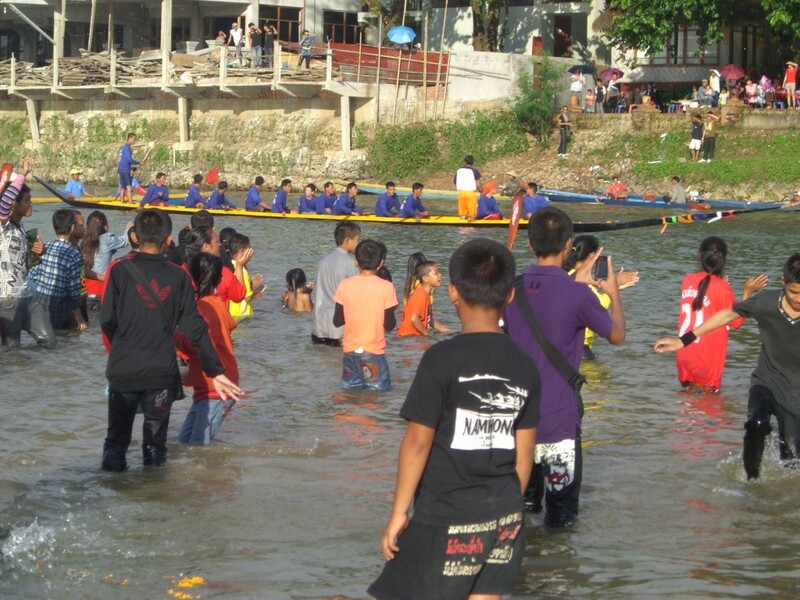 I decided to attend the boat racing portion of the festivities in town. 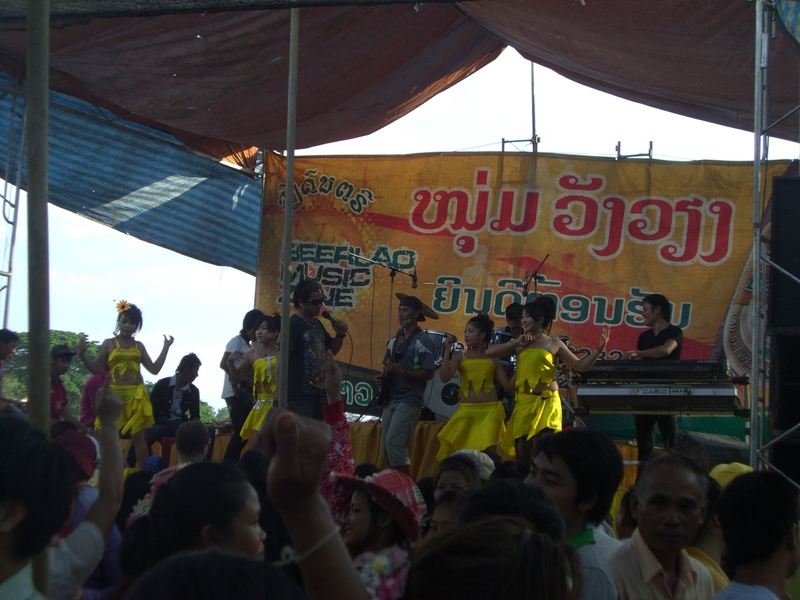 After crossing the river by foot, I had to pass a concert where the guy sang Lao rock n’ roll while four girls dressed as daffodils/sunflowers danced on stage. 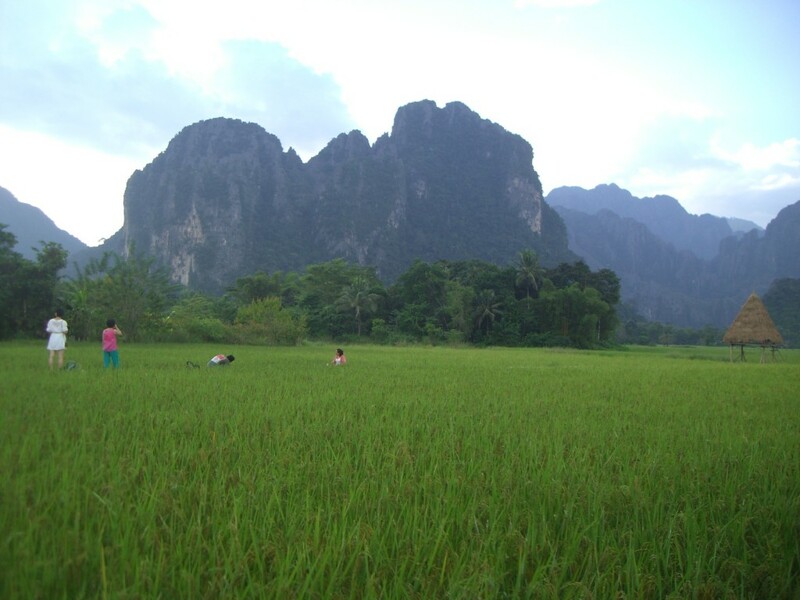 Everyone was passing around the ubiquitous Beer Lao. A lady holding a sleeping baby in her arm gave me a shot of Beer Lao – party on momma, party on… I proceeded to the section where people were watching the boat race. They race with “dragon boats” which are long wooden boats that hold about 10 to 14 rowers. To me the most interesting part of the race wasn’t so much the boat racing itself but the audience standing in the river dancing, screaming, and splashing while kids swam right near the path of the boat race. The racers would just row around the kids. Unfortunately no kids were harmed but I only caught the very end of the boat race so my exposure to the festival was rather minimal. This team came in last place. After the boat racing I forged on to explore the land behind the festival and stumbled upon this little gem: bamboo bungalows in the middle of a rice field and Japanese tourists hamming it up for their own photo session. 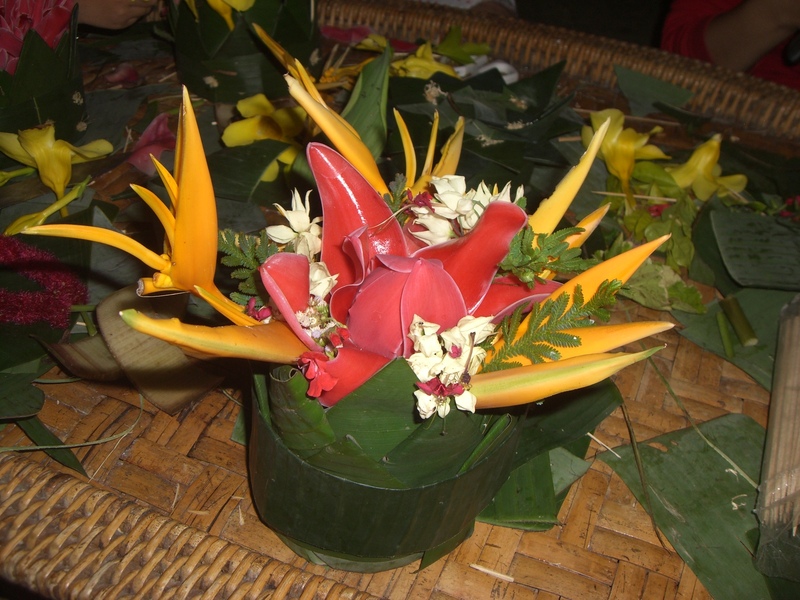 I biked home before dusk to prepare a “katong” – a small floating banana leaf bowl decorated with flowers, candle, incense, and sparklers (which I would not recommend for reasons you will soon find out). Here’s a snap shot of my katong sans candle, incense, and sparklers (which I would soon regret). At around 8 pm people from the surrounding villages paraded down to the river, screaming and drumming. 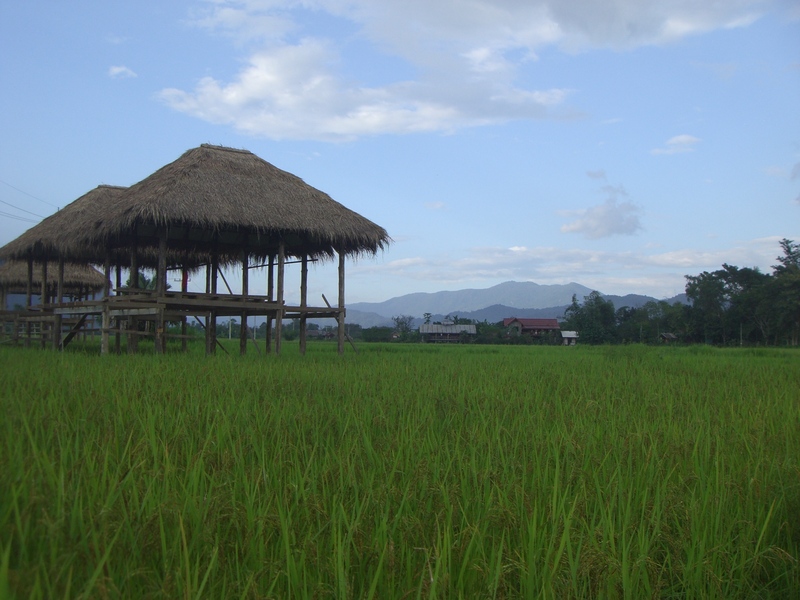 Everyone had a katong in tow. Almost all the kids had black cats and bottle rockets which they would happily throw near throngs of people. One landed near my feet and I managed to run away and scream like a little school girl before it exploded. It may all seem like fun and games, but it was very very unpleasant. 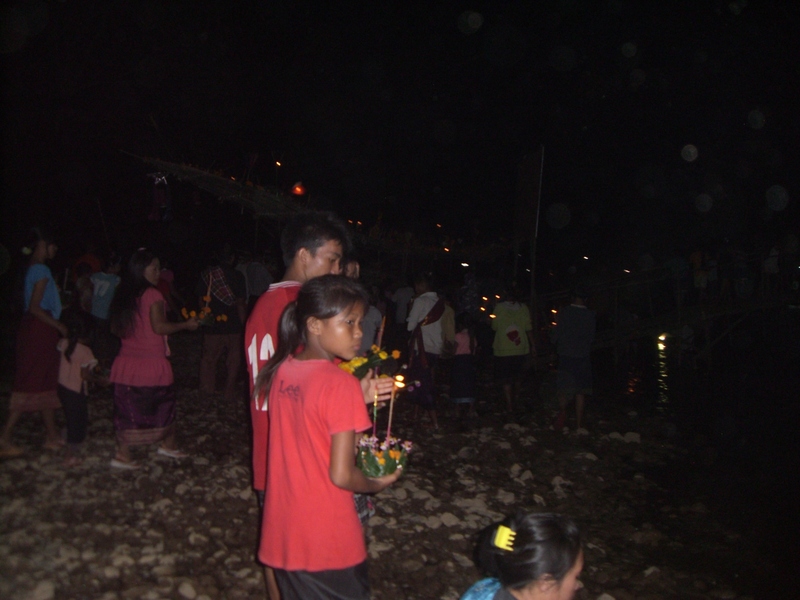 Once people got to the river, they lit up the katong, made a wish, and floated their katong down the river. 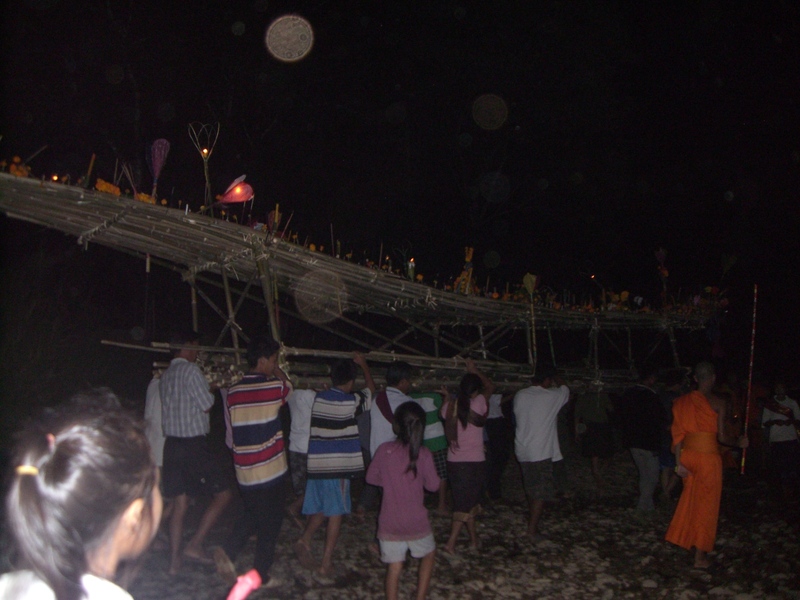 The Buddhist monks made a big bamboo framed boat with several candles and flowers, and sailed it down the river. Unfortunately I was unable to take the mother shot of all shots (the lit up boat and all the katongs floating down the river) because when I lit up my katong, the silly sparkler sparks were burning my dainty hands which caused me to drop my katong and my camera. I managed to rescue my camera but was unable to rescue my katong in order to make a wish for my mom. Instead I stood in the river, dripping wet, with a broken camera watching my katong keel over to its side taking out the candles and the sparkly sparklers. And that my friends is why sparklers are evil. People getting ready to light their katong.